Beautiful skin begins with Aquanil Cleansing Lotion. This mild daily cleanser effectively removes dirt, oil and make-up to reveal your skin’s natural radiance. 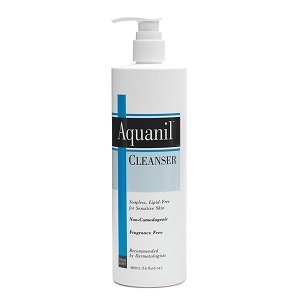 Aquanil Cleansing Lotion is hypoallergenic plus fragrance and soap-free for even the most sensitive users. Appropriate for all skin types, Aquanil Cleansing Lotion helps your skin retain its natural moisture to feel balanced and soft. Purified Water, Glycerin, Cetyl Alcohol, Benzyl Alcohol, Sodium Laureth Sulfate, Stearyl Alcohol, Xantham Gum. Apply a generous amount of Aquanil to wet or dry skin and gently rub. Remove the excess with water, a soft tissue or cloth.